Wall sheathing is the outside covering used over the wall framework and is nailed directly to the wall framing members. Sheathing provides a nailing base for some types of siding and backing for others. It can also be used to brace the structure, although in most cases sufficient bracing is provided by the interior wall finish. Insulating sheathing materials will not normally provide the required temporary or permanent bracing. 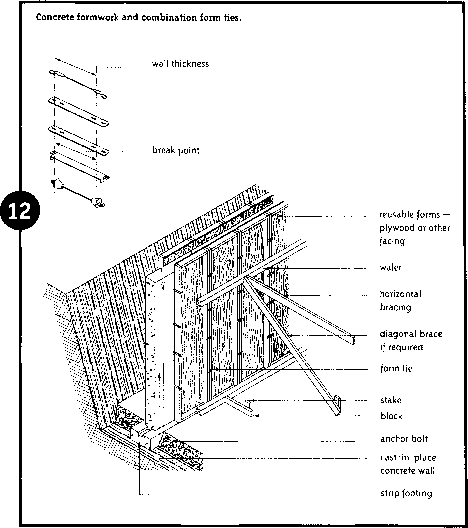 When such sheathing is used, let-in braces of wood or metal can be used as bracing if required. Sheathing must be applied to the gable ends and walls where the exterior cladding is a type that requires solid backing. Several types of sheathing are used in present-day construction: fibreboard, gypsum board, plywood, oriented strand board, rigid insulation and lumber. Table 35 lists the various types of sheathing and the minimum thickness necessary to provide sufficient backing for exterior finishing materials.